The Number Ones: The Beatles' “Yesterday” . Beatles Radio: The Beatles, Solos, Covers, Birthdays, News The Fab 4 and More! 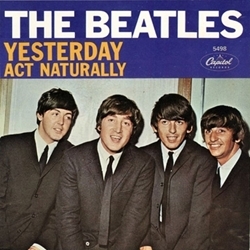 McCartney kept tinkering with “Yesterday” on the set of the Beatles’ movie Help!, reportedly aggravating both director Richard Lester, who threatened to take away his piano, and the rest of the band. He kept working on the words, too. For a while, the song’s working title, as a sort of private in-joke, was “Scrambled Eggs.” When McCartney did figure it out, when he recorded it, he was the only Beatle to do so.